The chamber of the historic Palacio Legislativo was full as Congressman Julio Rosas presented a medal recognizing Graz's tireless efforts to promote religious freedom. In his address to Congress before the presentation, Graz said, "Religious freedom is not the defense of one religion against others, but it is the defense of the individual right to be different, and to believe according to conscience." 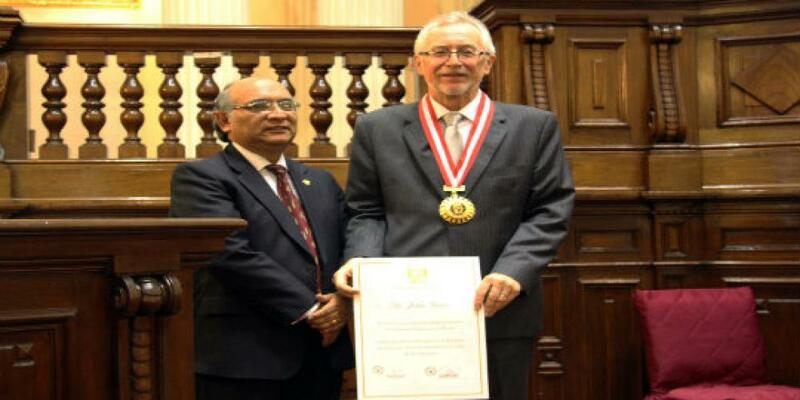 The prestigious medal comes following a more than 15-year relationship between Peru and the IRLA. In 2009, Peru hosted the first IRLA Festival of Religious Freedom, a massive event that drew more than 40,000 people to the National Stadium in the capital, Lima. The purpose of the festival, according to Graz, was simply to say “thank you” to the government of Peru for the religious freedom protections enjoyed in the country. Since then, some 30 IRLA Religious Freedom Festivals have been held on six continents. Graz says the Congressional Medal he received belongs to all those who have worked so hard through the years to promote the principle of religious liberty in Peru. While in Peru, Graz also gave a lecture at the Seventh-day Adventist Church’s University of Peru, where he was awarded the Fernando Stahl Medal for his two decades of work promoting religious liberty around the world. The medal is named for the Adventist Church’s first missionary to the Peruvian Andes in the early 1900s.